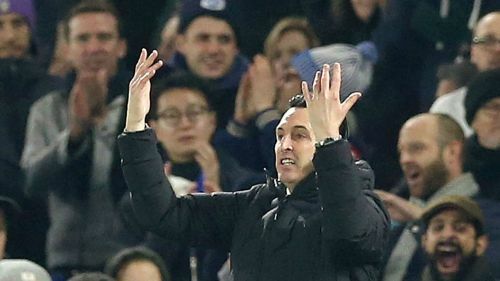 Unai Emery has apologised after kicking a bottle that inadvertently "touched" a Brighton and Hove Albion supporter in the crowd. A frustrated Emery lashed out during Arsenal's 1-1 Boxing Day draw against the Seagulls, but appeared to apologise to the fan in question after the unintended incident. Speaking at a post-match news conference, Emery again said sorry for kicking a bottle that went into the Brighton fans. "I said to them [the supporter], apologies, because I kick the bottle after a disappointing action for us in the last minutes," he told reporters. "It wasn't hard, but it touched one supporter for them. I said to them 'I'm sorry'." Jurgen Locadia secured a draw that moves Brighton 10 points clear of the bottom three, Pierre-Emerick Aubameyang having earlier opened the scoring after seven minutes. The Premier League's leading goalscorer wasted a glorious chance to extend Arsenal's lead as Mat Ryan made a fine save to keep out his effort on the half hour and the Australian was rarely tested after that, much to Emery's frustration. "I'm a little disappointed," he continued. "I think the key today was the first half. We controlled the match like we wanted to, we scored and had two good chances from Aubameyang to get the second, but then they equalised. "It gave us the second half to try again to control the match, create chances and be able to win, but we didn't do that. "In the second half we couldn't do our ideas on the pitch to impose [ourselves]. We created less chances in the second half. "Today was a very important three points, but football is like that and in 90 minutes we draw." Emery withdrew Mesut Ozil at half-time at the AMEX Stadium, but rather than it being related to the German's performance, the Gunners boss insisted it was a tactical decision. He added: "It was tactical. It's the same every match. Sometimes I change it tactically when I need something to change. "Today I did it with Mesut, that is only tactically, not another problem."